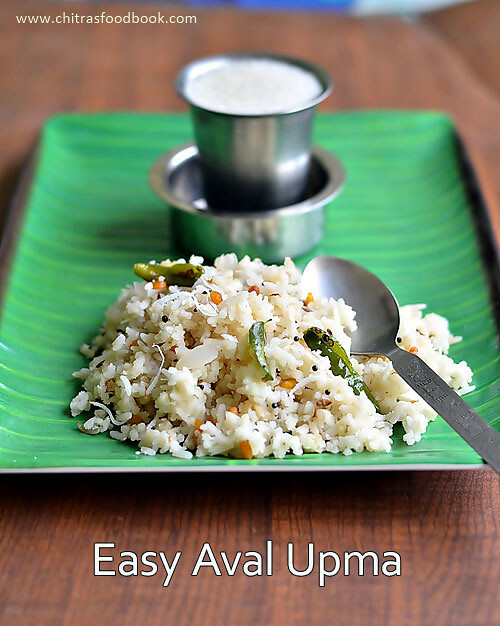 Aval upma is an easy and quick South Indian breakfast recipe that I make at least once in a week. I have already tried Karnataka’s Avalakki chitranna, North Indian - Maharashtrian Kanda Poha , Batata poha recipes and blogged here. 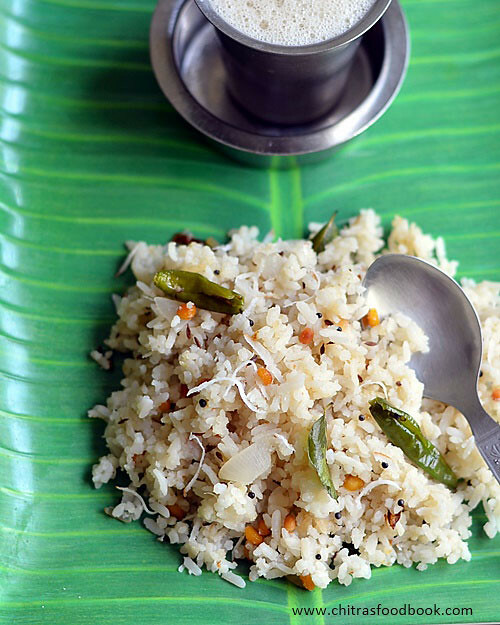 This poha upma recipe is very similar to both but its of Tamil nadu style.For this upma, I follow my Rava upma recipe and make it for our breakfast and sometimes for our dinner too. Its an easy to make recipe for bachelors and working women.Ideal for lunch box too. As Poha/Aval is a healthy alternative to rice, I try to include this in our diet by making varieties of poha recipes.To make it more healthy, you can use Kerala Red aval, add mixed vegetables and make the same. 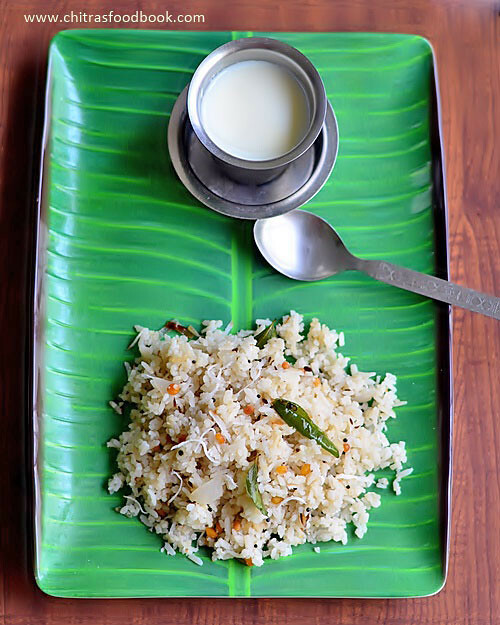 Lets see how to make this easy, diabetic friendly aval upma/Poha upma for breakfast & lunch box. Check out my Lemon poha/ Lemon aval recipe , Milagu jeeraga aval/ pepper cumin poha , Red Poha Upma too. Wash the thick aval/Poha for 2-3 times. This helps to get white colored upma. Add water to cover the aval and soak it for 10 minutes. All the water would be absorbed by the poha in 10 minutes and it becomes soft. In the mean time, chop onions, chillies and ginger. Heat oil and temper mustard seeds, urad dal and chana dal. Add hing, curry leaves, onions, green chillies, ginger and salt. Saute until onion turns transparent. Now add the soaked aval and mix well. Keep the flame low. Cover the kadai with a lid and let the aval cook for 5 minutes. After the poha turns soft and cooked, switch off the flame. Add 1 tbsp of coconut oil , grated coconut mix well and serve hot. Enjoy this easy breakfast with coffee/tea ! 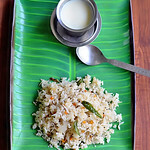 Washing the poha twice or thrice is necessary to get white colored upma. Soaking helps to make soft and quickly cooked poha. So Soak it atleast for 10 minutes. Add more green chillies or pinched red chillies for more spicy taste. You can add peanuts, finely chopped carrot, potato while sauting onions. If you wish, you can add a dash of lemon juice at the end.